Anjna Swaminathan is a 2019 commissioned artist. enters into others that are new. For her Commission at Roulette, composer, violinist, vocalist and theatre artist Anjna Swaminathan presents WOVEN: Entangled Memorabilia—a multidisciplinary work that brings together original music, poetry, and improvisation to meditate on personal, cultural, and artistic rituals of nostalgia, loss, and mourning. The project was initially inspired by the works of Indian Malayali painter and artist Raja Ravi Varma (1848–1906) and Tamil poet Subramania Bharati (1882–1921), both late 19th to early 20th century artists who were integral to shaping images of women as vessels for Indian national identity during the movement against the British Raj. Read our Spotlight interview with Anjna in our Spring 2019 zine or online here. Swaminathan’s poetry also seeks to juxtapose Hindu Vedantic ideas of loss as a necessary part of progress with contemporary Indian nationalism’s reluctance to accept change. While religious rituals of mourning may impose on people an active forgetting, so many of the daily rituals of home involve a preoccupation with holding on. In WOVEN: Entangled Memorabilia, these paradoxes of nostalgia converge in the stories of cultural nomads, who at various stages of immigration, mourning, and self-awareness, find themselves in that liminal space between “letting go and holding on.” Immigrant housewives and irreverent teenagers merge with dying national icons and eternal goddesses to grapple with these profound questions of home, tradition, and embodied experience. The work attempts to personalize the political and mythical, bringing a sense of temporality to religious rituals and a sense of divinity to quotidian coping mechanisms. The widow who self-pleasures in remembrance of her dead husband is thus no different from the teenager lighting her mother’s funeral pyre. Introspective, emotive, and expansive, the score for this work incorporates over 40 voice recordings gathered from interviews with a diverse community of people from all walks of life – South Asians, African American men and women, trans and trans non-binary people, mothers, fathers, immigrants, artists, musicians, teachers, students, and thinkers. It deconstructs the microtonal, rhythmic, and improvisational vocabulary of Indian classical music and acts as a response to the cultural trauma, disillusionment, and wonder expressed in the poetry. Now, after a yearlong fellowship in composition and notated music under acclaimed composer Gabriela Lena Frank’s Creative Academy of Music, Swaminathan considers the cultural and personal “memorabilia” held within the sonic bodies of four classically trained string musicians from The Juilliard School. Combining her recent forays into western classical notated music, her rich training in Carnatic and Hindustani music as well as her immersive learning in New York’s vibrant creative/improvised music community, she works with these diverse and multifaceted instrumentalists to create a language that moves between oral tradition, notated music and improvisation. Alongside acclaimed improvisers Stephan Crump, Naseem Alatrash, and Swaminathan herself, the string quartet acts as a timeless, placeless Greek chorus guideing the audience through a collective funeral ritual. Borrowing from the Hindu philosophy that a deceased soul is trapped between its earthly bonds and its potential for forward blossoming, the collective works together to disentangle the memorabilia of spirits both living and dead. Swaminathan suggests that this reconfiguring of oneself should not be limited to one’s passing, but can be done in our daily lives as a way to connect to our larger humanity. In their shared ritual, the artists in WOVEN: Entangled Memorabilia offer the audience space to reflect on their own divisions of life and death; ritual and spiritual; body and soul all as they relate to the liminality of being between worlds. 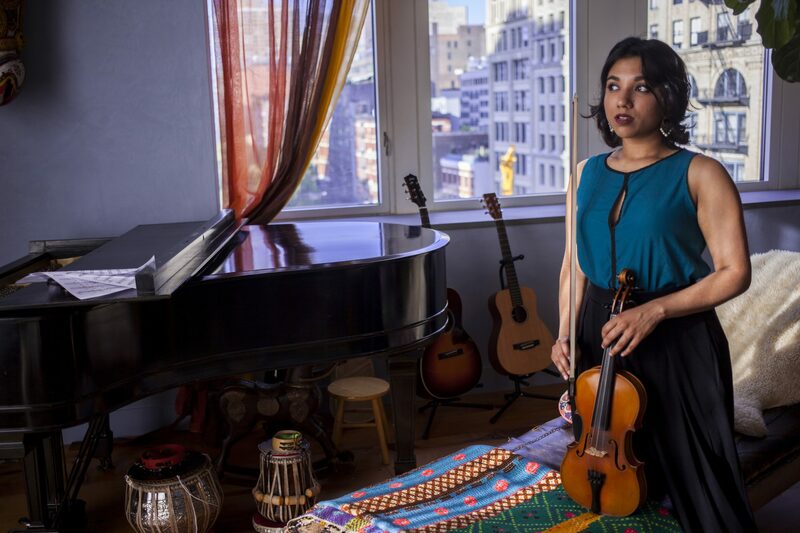 Anjna Swaminathan is a versatile violinist, composer, and multidisciplinary artist. A disciple of the late violin maestro M.S. Gopalakrishnan and H.K. Narasimhamurthy, she performs regularly in Carnatic, Hindustani and creative music settings. Her current mentors include Samarth Nagarkar (Hindustani music) and T.M. Krishna (Carnatic music). Anjna is a budding composer and was a 2018 composer fellow at the Gabriela Lena Frank Creative Academy of Music, where she premiered her string quartet A Secret Rendezvous for Del Sol String Quartet. In March 2019, Anjna will be premiering her new string quartet “Duplicity” commissioned by Orchestra St. Luke’s and GLFCAM for Carnegie Hall’s Migrations: The Making of America festival. As a theatre artist, writer and dramaturg with interests in the intersection of race, class/caste, gender and sexuality, Hindu Vedantic philosophy, and the boundaries of postcolonial Indian nationhood, Anjna often engages in artistic work that ties together multiple aesthetic forms towards a critical consciousness. She leads the multidisciplinary project WOVEN, which brings together original music and poetry to meditate on rituals of memory, death, and nationality. In April 2019, she will be premiering a new iteration of WOVEN, commissioned by Roulette Intermedium in Brooklyn, NY. Anjna holds a bachelors degree in theatre from the University of Maryland, College Park. Memphis-bred, Grammy-nominated, Echo Award-winning bassist/composer Stephan Crump has lived in Brooklyn since 1994. An active bandleader, he has released twelve critically-acclaimed albums in addition to numerous film scoring contributions. Known for transforming his instrument into a speaking entity of magnetic pull, his focus on creative instrumental music has led to collaborations with many of the leading lights of his generation, most notably Vijay Iyer, in whose trio and sextet Crump plays a dynamic, founding role. He can also be heard as a long-standing member of Jen Chapin Trio, Ches Smith Trio, Rez Abbasi Acoustic Quartet, Liberty Ellman Sextet, Secret Keeper (duo with Mary Halvorson), his own Rosetta Trio (with Jamie Fox, Liberty Ellman), his Rhombal quartet (with Ellery Eskelin, Adam O’Farrill, Tyshawn Sorey), as well as co-led ensembles with Kris Davis, Ingrid Laubrock, Cory Smythe, Eric McPherson, Mat Maneri, and Okkyung Lee. Palestinian cellist Naseem Alatrash was born on October 4, 1991. His performance on cello is creative, untraditional, and unique. Alatrash is an accomplished classically trained musician who is also deeply rooted in the Arabic musical tradition and yet influenced by jazz and other contemporary styles. He has earned a reputation for fearlessly broadening the horizons of the cello on the world stage by using it in untraditional settings. After studying at The Edward Said National Conservatory of Music in Palestine, he completed a college preparation program in Germany. Alatrash later was the first Arab ever to be awarded a full presidential merit-based scholarship to attend the prestigious Berklee College of Music, in Boston, Massachusetts, where he went on to achieve the highest honors in cello performance. Later he received a master’s degree in cello performance at the Global Jazz Institute at Berklee College of Music as well as a post-master’s fellowship degree. Leerone Hakami, Israeli-American violinist, began her studies at age five after begging her parents to play the violin. She attended Mannes Pre-College, and currently studies with Lewis Kaplan at The Juilliard School. Leerone greatly enjoys collaborating with musicians outside of the classical realm, such as International Contemporary Ensemble and DJ LibraNine. With a love for teaching, Leerone is the co-founder of The Heartbeat Project- a workshop aimed at teaching music alongside math to children on the Navajo Reservation of New Mexico. She also received a grant to facilitate a workshop in Israel that included a musical collaboration between Arab and Israeli musicians, in an effort to promote inclusion and the celebration of differences. As a passionate chamber musician, Leerone and her string quartet are part of the Juilliard Honors Chamber Music program, and her quartet performs regularly for Holocaust survivors. A lover of travel, Leerone has performed in festivals in France, Italy, Israel, Canada, and the USA. She has performed in masterclasses of Lawrence Dutton and the Pacifica Quartet, and appeared in publications of Newsday as a Long Island Arts Alliance Scholar Artist. Leerone had the pleasure of performing in both Carnegie Hall’s Weill Recital Hall and Lincoln Center’s Merkin Hall as the recipient of top prizes in competitions such as the New York Artists International Competition and the International Virtuoso Competition, and she had the honor of soloing with the New York Concerti Sinfonietta and the Vermont Mozart Festival Orchestra. New York native Manami Mizumoto started her lifelong relationship with music at age three on the violin. Early exposure to chamber music both at home and later in her studies, sparked in her a devoted love of collaboration. This led to a fascination with performing contemporary music and working with living composers, which recently led to a project to benefit women’s shelters in NYC. With Uhuru Quartet, a group she is a founding member of, Manami co-created and led a songwriting workshop as well as a benefit concert with composer Sato Matsui at the Women In Need shelter, and hopes to continue growing this project with more composer-collaborators and shelters in the future. Her driving curiosity is currently in exploring the dialogue between ancient and contemporary thoughts, as well as the dichotomy between nature and human development. Manami currently studies at the Juilliard School, where she is in the Historical Performance program for her Masters’ degree. Violist Lauren Siess has enjoyed a varied musical career, beginning her musical life studying jazz/classical guitar and violin. Committed to developing creative concert programs that engage diverse audiences, Lauren will be presenting an interdisciplinary concert at Arete Venue and Gallery in May titled “middle voice,” showcasing world premieres for solo viola, electronics, and dance. Other highlights of the 2018-19 season include performances with the Juilliard Orchestra at Alice Tully Hall, under the batons of Itzhak Perlman and Barbara Hannigan. Lauren has been a member of the Perlman Music Program since 2012, with residencies in Shelter Island, NY; Sarasota, Florida; and Tel Aviv, Israel. In Summer 2018, Lauren attended the Yellow Barn Program and has previously attended programs at the Banff Centre, and Keshet Eilon Summer Mastercourse in Israel. Lauren is in her fourth year of undergraduate studies at the Juilliard School as a student of Carol Rodland and is a proud recipient of a Kovner Fellowship, and member of the Gluck Community Service Fellowship. An alumnus of the Colburn Music Academy, Lauren was featured as soloist with the Colburn Academy Virtuosi Orchestra and Colburn Chamber Orchestra, and served as principal viola of both orchestras. Her former teachers include Paul Neubauer, Helen Callus, and Brian Quincey. Brooklyn multi-instrumentalist Aaron Stokes made his musical start on a 20-dollar Fisher-Price keyboard. Since then, he’s performed alongside top artists such as Solange Knowles, Chris Martin, and The Kronos Quartet, crisscrossing the unchartered path between Pop and Classical genres. Stokes began studying church organ at age three, where he began to exercise his musical capabilities rooted deeply in gospel and contemporary forms of music. Not stopping there, Stokes’s fervent desire for music led him to the cello where he embarked on his journey through classical studies. His former studies are with award-winning cellist Amy Kim at the preparatory division of Mannes the New School for Music. He then pursued his Bachelor of Music under the tutorship of world renown pedagogue Marcy Rosen, at the Aaron Copland School of Music. In addition to his training, Stokes has coached with members of Ensemble Connect—a program of Carnegie Hall, The Juilliard School, and the Weill Music Institute, in partnership with the New York City Department of Education. Aaron’s dedication to his instrument has led to notable performances at Carnegie Hall, The Grammys, The United Nations Head Quarters, Lincoln Center, and Radio City Music Hall. On top of his his solo performances, Aaron is an active member of the Collaborative Arts Ensemble and the Association of Dominican Classical Artist. Stokes has shared the stage with outstanding soloist and ensembles such as Ryu Goto, Jack String Quartet, Shirley Ceasar, and has performed with the String Orchestra of Brooklyn. Stokes is also the founder of his very own business, Stokes Strings Conservatory. Through his business, he strives to enrich the lives of at-risk youth with weekly strings and piano tutorship. Aaron Stokes is a young and enthusiastic performer who is making conscious actions to enhance the world through the gift of music. 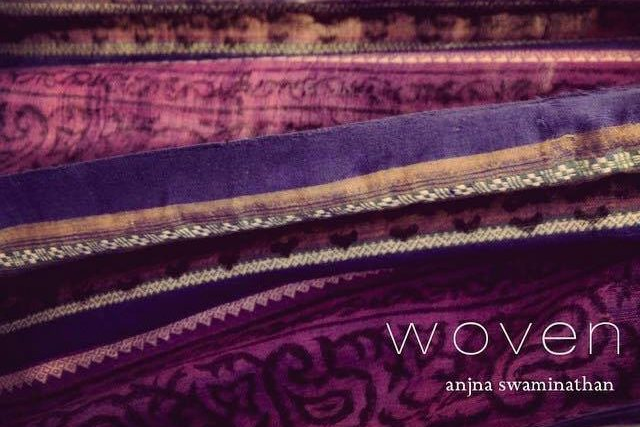 Anjna Swaminathan’s WOVEN: Entangled Memorabilia is made possible, in part, by the Jerome Foundation. The Jerome Foundation, a long-time supporter of young composers, was a mainstay in Roulette’s early development and continues to help us fulfill our mission by presenting ambitious work by promising artists. 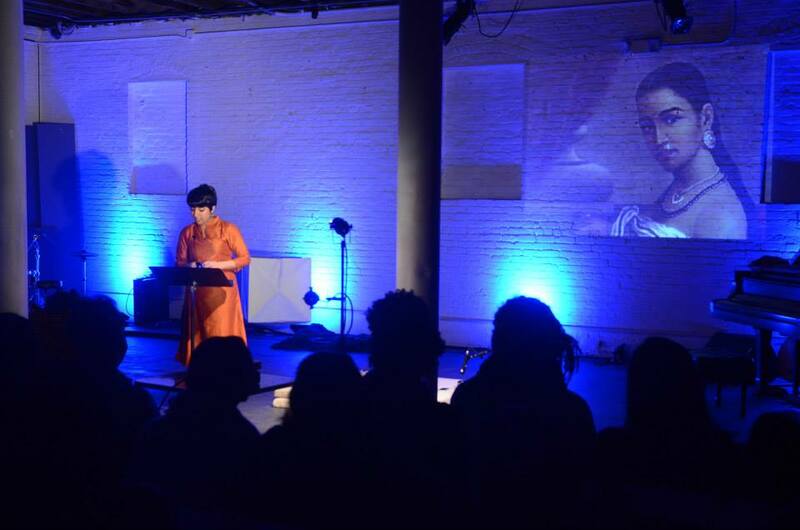 Each year, the Jerome Foundation supports five artist residencies and four commissions at Roulette.